Lily Furedi, "Subway", 1934. Oil on canvas. Smithsonian American Art Museum. Transfer from the U.S. Department of the Interior, National Park Service. PITTSBURGH, PA.- On January 30, 2010, 1934: A New Deal for Artists opens at the Frick Art & Historical Center in Pittsburghs East End. Providing a view of America in 1934 as seen through the eyes of its painters, the exhibition was organized to celebrate the 75th anniversary of the Public Works of Art Project from the Smithsonian American Art Museums unparalleled collection of paintings created as part of the program. 1934: A New Deal for Artists, will remain on view at The Frick Art Museum through April 25, 2010. The exhibition is open to the public and admission is free. In 1934, Americans grappled with an economic situation that feels all too familiar today. While unemployment was more than 25% during the Great Depression, government programs to alleviate suffering were as controversial then as they are now. Against this backdrop, the U.S. government created the Public Works of Art Projectthe first federal government program to support the arts nationally. The nation looked expectantly to President Roosevelt, who was inaugurated in March 1933. The new administration swiftly initiated a wide-ranging series of economic recovery programs known as the New Deal. The President realized that Americans needed not only employment but also the inspiration art could provide. The Advisory Committee to the Treasury on Fine Arts organized the Public Works of Art Project on December 8, 1933. Shortly thereafter, 16 regional committees were recruiting artists who eagerly set to work in all parts of the country. From mid-December 1933 to June 1934, artists participating in the program were encouraged to depict the American scene, but were free to portray any subject. Simultaneously exuberant, colorful, serious, and diverse, the 54 paintings included in 1934: A New Deal for Artists provide a composite portrait of America during the Depression. The paintings in the exhibition were created by 53 artistsmen and women whose birthplaces spanned the country (and in some cases the globe), and who conveyed in their work a distinctly diverse vision of America. The New Deal arts programs were open to artists who were denied other opportunities, such as African Americans and Asian Americans, as well as immigrant artists. Artists like Earle Richardson (19121935), who painted Employment of Negroes in Agriculture, 1934, and Kenjiro Nomura (18961956), creator of The Farm, 1934, subtly indicated the plight of their fellows: blacks who were victims of the sharecropping system and foreign-born Japanese Americans who were prevented from owning land. While the program lasted just seven months, it funded 3,750 artists who produced 15,600 artworks at a cost of $1,312,000. Scenes of ice skating, baseball, subways, highways, and farms convey a sense of commonality, while specific landscapes and cityscapeslike the two canvases by Pittsburgh artist Harry W. Scheuch (19061978) documenting the construction of the Cathedral of Learning at the University of Pittsburghprovide glimpses of distinct localities. The exhibition is generally organized into themes that captured the interest of artists at the time. Portraits, industry, labor, city life, landscapes, and rural life are all captured in this exhibition, which provides a unique and lasting visual record of America at a specific moment in time. Artist Harry Scheuch painted the Cathedral of Learning twice for the PWAP. One image is a close-up view of the masons at work, and another depicts a more distant view that reveals the horde of workers involved. Together the two paintings tell the story of this mighty undertaking. The 42-story structure was not substantially completed until 1937, and some interior work continued for decades after that. Like the Golden Gate Bridge, construction of which is also depicted in the exhibition, construction of the Cathedral of Learning was halted due to lack of funds. New Deal government construction grants enabled these two mammoth projects to continue and to employ hundreds of workers. Like Scheuchs Cathedral of Learning paintings, many of the works in the exhibition glorify work or document industrial sites. Paintings such as Northern Minnesota Mine by E. Dewey Albinson (18981971), however, implied an active work site wherein factthere was no work to be had. Along with gritty industrial scenes and urban landscapes, E. Martin Henningss painting for the Public Works of Art Project, Homeward Bound, 1934, portrays two Native Americans from Taos Pueblo: a man wrapped in a traditional white blanket and a woman wearing a colorful shawl. This serene painting speaks of the deep love Hennings felt for Taos, New Mexico, where he was a leading member of the artists colony. His subjects walk quietly through the snow together as the sun sets behind them. In works like this, Hennings created poetic visual connections between the people of Taos and the stunning high desert where they lived. City and rural life were popular subjects for artists of this time. 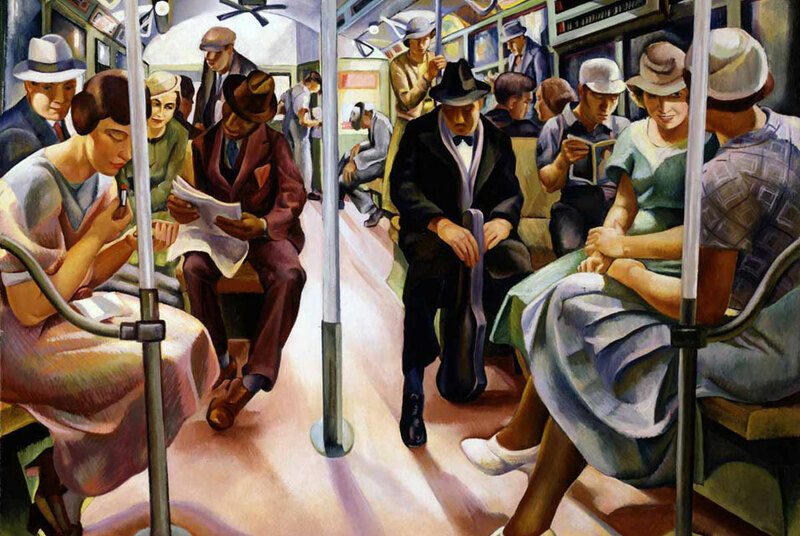 Lily Furedi (1896 1969) painted subway passengers in a simple stylized form thatat the same timeprovides clues to each individuals own story. Ross Dickinsons (19031978) Valley Farms, also uses simple forms that eloquently speak of the precarious situation of farming in California during the Depression. In his painting, orange hills loom over a small cultivated area below. Allusions to the ever-present threat of fire are included in the forms of a farmer burning trash in the foreground and a plume of smoke from a wildfire in the distance. Dust bowl migrants sought work in places such as this California valley. In April 1934, the Corcoran Gallery of Art in Washington, D.C., exhibited more than 500 works created as part of the Public Works of Art Project. Selected paintings from the Corcoran exhibition later traveled to the Museum of Modern Art in New York City and other cities across the country. President Roosevelt, First Lady Eleanor Roosevelt and government officials who attended the exhibition in Washington acclaimed the art enthusiastically. The Roosevelts selected 32 paintings for display at the White House. The success of the Public Works of Art Project paved the way for later New Deal art programs, including the Works Progress Administrations Federal Art Project. Nearly 150 paintings from the Public Works of Art Program were transferred to the Smithsonian American Art Museum during the 1960s, along with a large number of artworks from subsequent programs that extended into the 1940s, especially the well-known Works Progress Administration. The museum has one of the largest collections of New Deal art in the world, numbering nearly 3,000 objects.